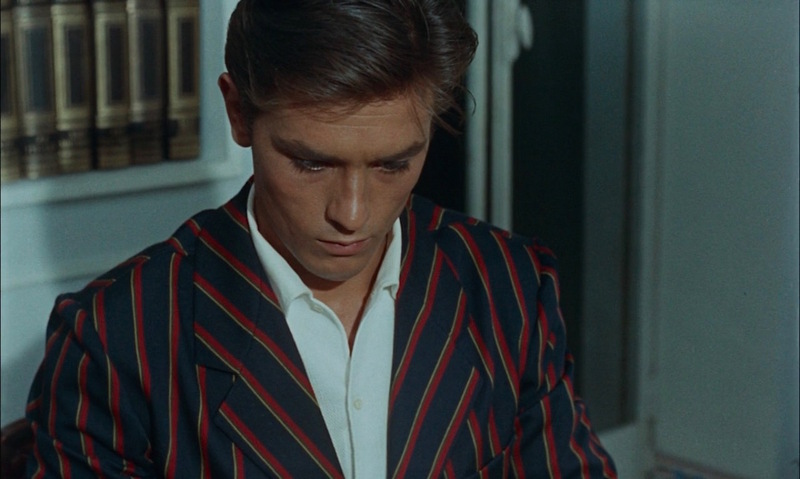 Purple Noon is an aesthetic treat from Henri Decaë’s lush cinematography to the stylish costumes of Bella Clément, for whom Purple Noon remains her sole credit and whose possible relation to director René Clément remains a mystery to me. 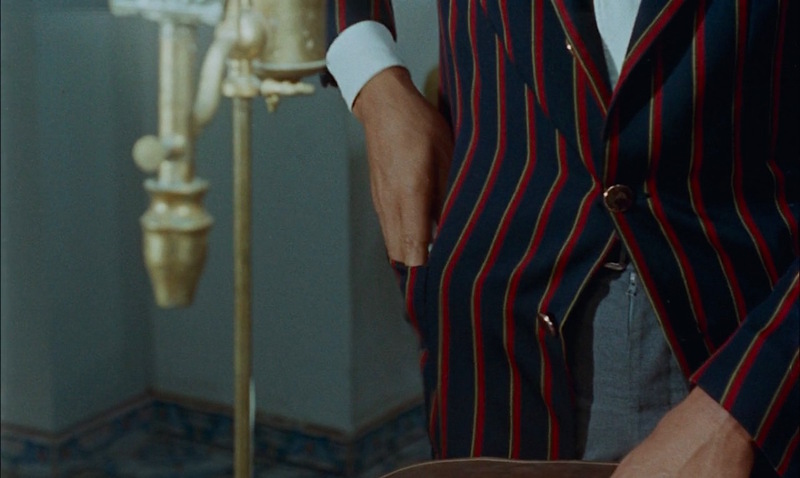 One particular item receives significant on-screen attention: Philippe Greenleaf’s boldly striped regatta blazer that betokens Tom Ripley’s wish to become him. Today, the most universal description of a blazer would be a jacket tailored like a suit coat but with a more casual cut, with ornamental buttons and made from a durable yet formal fabric like wool. Navy remains the most traditional color, though it’s not uncommon to see correctly described blazers in shades of gray, red, green, and brown. 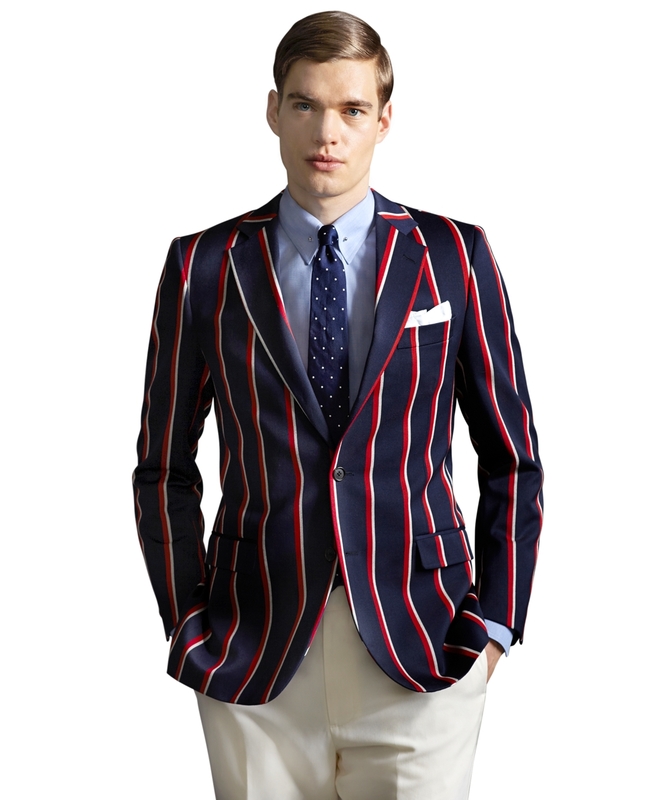 In 2013, Brooks Brothers introduced its wool-and-cotton Red, White, and Navy Stripe Regatta Blazer as part of The Great Gatsby Collection, itself inspired by 1920s nostalgia. Unfortunately, contemporary nomenclature has complicated the term for menswear enthusiasts, shrouding the once-specific garment terminology in the muck and mire of modern shortcuts that classify any odd jacket under the “blazer” umbrella. Strip away the decades of uninformed labeling and Macy’s marketing tactics, and you’re left with a vibrantly colored – and often boldly striped – jacket. Like many menswear staples, the blazer’s origins can be traced to the sea. In post-Regency era England, the gentlemen of Oxford and Cambridge rowing clubs sported bright club jackets that took the venerable appellation of “blazers” based on their bold hue. In particular, the Lady Margaret Boat Club of St. John’s College is frequently cited as a major influence for its seminal red flannel blazers. Over the 19th century, the terminology evolved to include the variety of boldly colored and striped jackets favored by nautical sportsmen to the point that “by the 1890s, all flannel, loose-fitting casual jackets (which were at the time generally brightly colored) began being known as blazers,” according to Town & Country Magazine. The blazer crossing the Atlantic at the dawn of the 20th century saw the rise of a more subdued style, the navy single-breasted blazer that remains a classic American staple to this day. More than a century after their genesis, the original garment found popularity among English mods and bands of the British Invasion who often sported striped boating blazers or piped-collar rowing jackets for their performances. 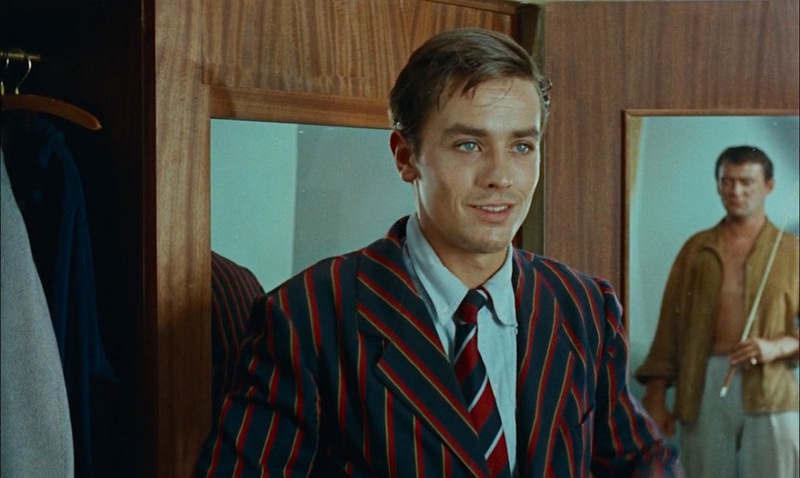 It was just before this resurgence in the 1960s that a striped boating blazer appeared in Purple Noon, first seen as Tom Ripley (Alain Delon) eagerly tears through the closet of his wealthy pal, Philippe Greenleaf (Maurice Ronet). Philippe is not so amused by Tom trying on his clothes, although the fashion plate Philippe may be more offended by the clashing stripes of the jacket with the tie that Tom chose to wear with it. A few murders and many deceptions later, Tom inexplicably dons the same garment when he returns to Phillippe’s home to frame the deceased man for the murder of their mutual pal Freddie. Of his newly expanded wardrobe, he couldn’t have picked a more conspicuous outfit while trying to lay low. Philippe’s striped regatta blazer is actually subdued when compared to some of the stripes seen on early examples. Contrasting with the blazer’s navy ground is a pattern of bold red stripes, each shadowed along the right side with a slimmer “old gold” yellow stripe. The single-breasted blazer has substantial notch lapels that roll to three flat gold shank buttons with two matching buttons on each cuff.. Tom wears the blazer with the center button fastened, correctly meeting the trouser waist line. After Tom’s lack of success sporting the blazer with his own blue button-down collar shirt and Philippe’s striped tie, he wisely opts for a more dressed-down approach for his nighttime return to Mongibello and the forging of Philippe’s suicide note. Tom’s white cotton pique shirt has a soft, one-piece spread collar worn open at the neck with a plain button-up front and rounded cuffs that each close with a button. Note the unique unpadded shoulders with sleeveheads rolled to create the effect of roping, a signature of the Neapolitan “con rollino” technique. Both the shirt and the trousers were previously worn during Tom’s trip to Naples with Marge, with which he wore the blazer-style three-button jacket from his light gray linen suit. These gray wool flat front trousers have a medium-high rise and a straight fit through the legs to the plain-hemmed bottoms. The blazer covers the slanted side pockets with buttoning flaps and the set-in back pockets also with buttoning pointed flaps. 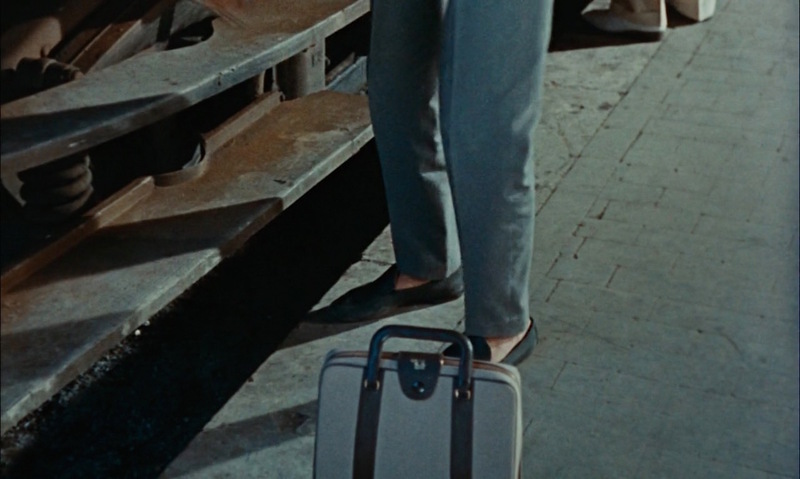 Tom wears a black leather belt that coordinates with his black leather loafers, worn sans socks. Tom packs light for his return trip to Mongibello. 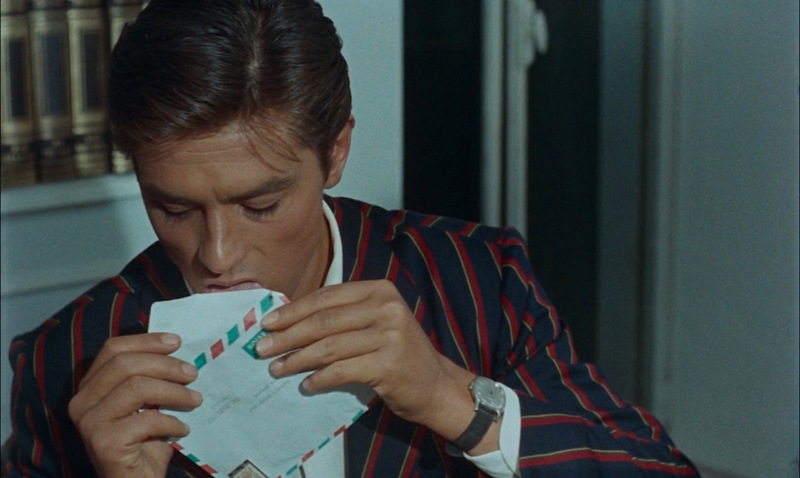 Despite assuming Philippe Greenleaf’s identity and much of his clothing, Tom Ripley sticks with the same wristwatch he’s been wearing since the beginning, a plain steel timepiece with a round silver dial on a dull dark navy strap. Tom puts the finishing touches on his crooked handiwork. 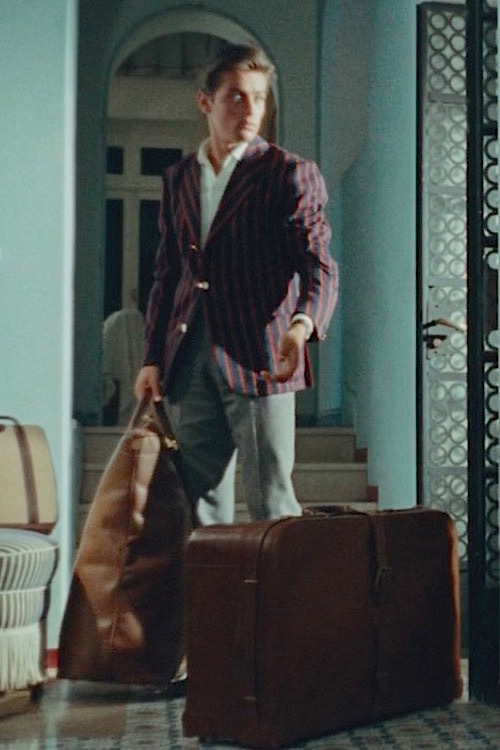 You have to respect Tom Ripley’s sartorial savvy, even if there’s little else about him deserving of respect. He chooses a classically inspired striped boating blazer from his late buddy’s wardrobe… though he also chooses an unusual time to sport this attention-getting piece. If you’d like to learn more about the history of these distinctive boating, rowing, and regatta blazers, delve into Jack Carlson’s extensively researched and exquisitely illustrated volume Rowing Blazers, published in 2014. You should a look at the black three-piece suit that Daniel Craig wears during the Rome sequence in Spectre. Fantastic blog, keep up the great work! 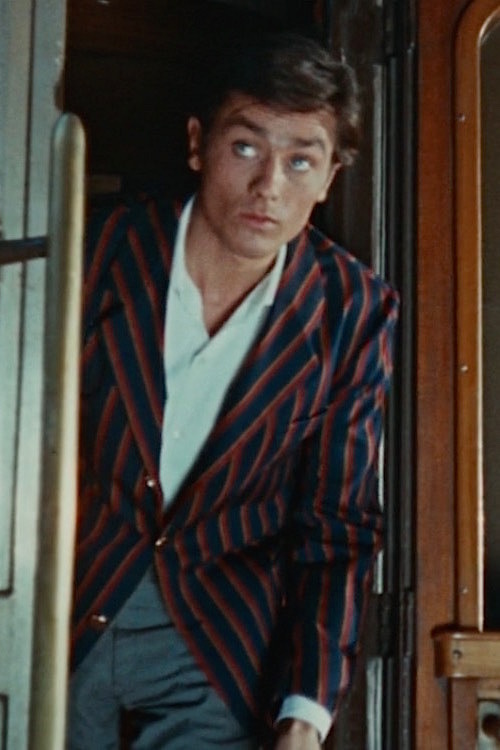 Too tight to be elegant that so called James Bond..
You’ve unearthed a style treasure trove with Alain Delon. One detail about the blazer here that I like, the collar is cut so that the stripes line up perfectly with the stripes on the lapels. It’s not something you see on striped jackets, but I think the effect helps with the boating blazer.